You can't go to college without a few dorm washcloths in your college supplies. While you may be able to use your dorm bath towel quite a few times and drying it on your dorm drying rack before finally putting it in your dorm laundry bag, you'll find you can't do the same with your dorm washcloths. These dorm essentials need to be washed often as they will be collecting soap and face oils, and you want to avoid irritated skin. Make sure you have the dorm bathroom essentials you need to start college out right with our Super-Dry USA Cotton Washcloths (2 Pack). Our Super-Dry USA Cotton Washcloth will make drying this dorm essential on your dorm drying rack much easier. 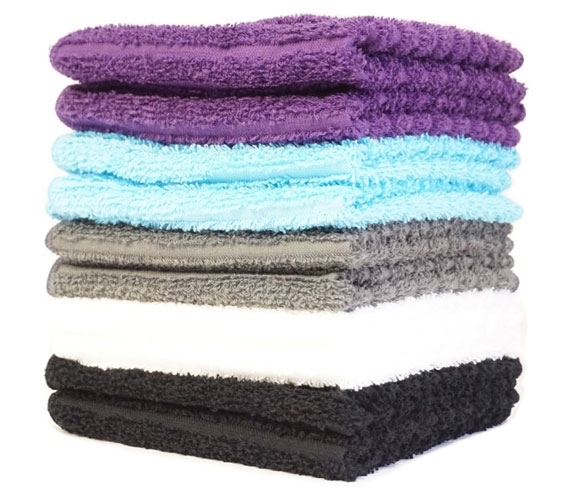 This dorm necessities item has a quicker drying time than your average washcloth due to the ribbed construction. This enhanced drying time is essential when you're reusing your dorm washcloths, so whether you put this dorm essentials item in the dorm dryer or place it on your dorm drying rack, you'll have decreased drying time. Available in a variety of vibrant colors, you can even add to your dorm room decor while your washcloth is drying! You don't want to wash in the morning with a thin, scratchy dorm washcloth - add our incredibly soft, plush Super-Dry Cotton Washcloth that is made in Canada with USA Cotton to your dorm essentials.